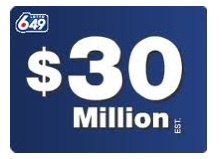 The next lottery 649 draw is for $3,000,000. This isn't a huge sum by today's standards but it would do nicely. I'm thinking I could pay off my credit cards and still have some left over. Maybe I could even squeeze in a trip to Paris. "This won't change me. I'm keeping my job at the factory and might take the family to Disneyland for a little holiday, or buy a van". OK. I admit I made it too hard. I'd be a great rich person. Ask anyone. I'd share the win with all kinds of people. A gift out of the blue would be exciting don't you think? Imagine if you received $100,000 from someone you met once in line at a grocery store. Wouldn't that be great? Or, if a Google or Twitter pal sent you $50,000 for no reason. Bill Gates should have thought of this. And wouldn't it be a boost to the economy? Hey, maybe I should run in the Federal elections. I have a new ticket to run on - The Lottery Ticket. Well, I'll worry about that when I win. The thing is, they never choose my numbers. Never. Why is that? It doesn't seem right to me. I'll try again anyway - not for me you understand, for everyone else. If I win a biggie, a lot of you will be hearing from me. Anyone leaving a snotty comment, however, will be out of luck. By the way, I see that the chances of getting 6 out of 6 numbers is 1 in 13,983,816. Seems reasonable. Maybe I'll buy two this week. My favourite way to drift off to sleep, is running through my shopping list of how I'm going to spend that £100 million I'll wake up in the morning to find I've won.. In reality, it's unlikely - but in my dreams (ahhhhhhhhhhh)..! We think you're on to something! So nice of you to visit! Please come by anytime! I'll let you both know if I win!